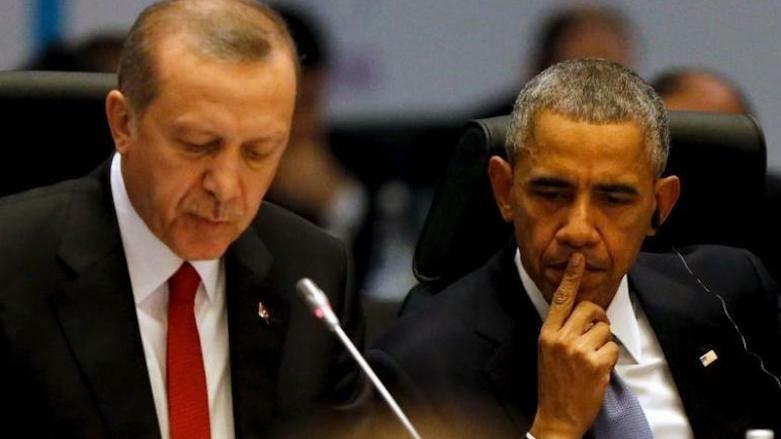 Barack Obama deceived Erdogan over PKK But who deceived the Ummah? Turkish leader tells Al Jazeera he hopes for stronger ties between Turkey and US under Donald Trump’s administration. Turkey’s President Recep Tayyip Erdogan is planning to meet his US counterpart Donald Trump next month, hoping for stronger ties with the United States after being “deceived” by ex-President Barack Obama. Erdogan made the comments in an interview with Al Jazeera that was broadcast on Wednesday, three days after he hailed a “Yes vote” in a referendum to amend Turkey’s constitution and grant the country’s presidential office new executive powers. “The most important point we discussed was about developments in Syria and Iraq. We plan to meet in May and we will discuss things further face to face. Donald Trump phoned Erdogan as first; to congratulate him with his victory in the referendum for a presidential system in Turkey, together with some lost poppet rulers in the Muslim world who are loyal to America. While, the rest of the Western leaders totally neglected him. This is an indication that the US-Turkey relationship will even be strengthened, more than before. Or with other words: Turkey will continue its loyalty to the American interest especially in the Middle-East region. As if this cooperation and serving the US, the biggest terrorist state, who has millions of Muslim blood on its dirty hands is not enough shame and disgrace. Erdogan is complaining that the former president Obama has deceived him with PKK and assumes Trump will not deceive him. I wonder was his definition of deceiving is? Does he really expect some dignity and honesty from the Kuffar who have transgressed all boundaries? Or is there something else going on, and he is not the deceived but the deceiver itself. Because, while he gives the impression that he is with the Muslims in Syria he loyally serves the American interests in Middle-East region against the Muslims. As he did not move an inch to stop the Assad regime and intensively worked together with the US, Russia and Iran in their mass killings of these same Muslims next door he claims to support! And he is complaining of being deceived because America supports the PKK? Also in the forerun of the referendum for the presidential system he propagated through different means that the presidential system is similar to the Ottoman Khilafah State and thus more Islamic and pointed out the so-called similarities between these two systems. Hereby he misused the honourable history of the people and their Islamic sentiments and gave them again the same rotten secular system. This time even more rooted. But the biggest deceive he did is to call for democracy which is Kufr and serves the agenda of the Kuffar, and called it Islamic as he explained it in an interview. The issue is that you can fool the people ones, or twice and even three times but on the end of the road the people will see it. May Allah (swt) give this great Ummah again insight and clear vision so we can walk strait on the lightened path to guide and serve the Muslims and humanity without being fooled by deceivers.